Mix the besan flour in a bowl . Add in the onions, fenugrek leaves, turmeric & chilli powder with salt & ginger . Mix a little bit of water to make a thick paste without any lumps but not too liquidy . Deep fry it in oil in shapes of pakora & serve hot . Yumm! 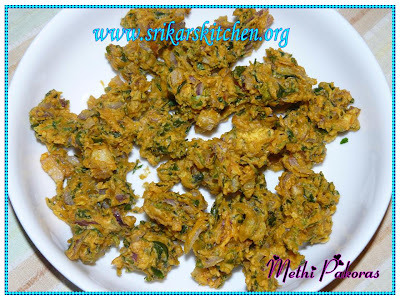 !crispy methi pakoras looks delicious Sri! Looks yum and crispy ! pakoras are alltime fav, perfect for rainy season! Hi, First time here... you have a very nice blog..
Looks crispy and greeny.. Yummy recipe! Wow looks so crispy and crunchy. Very good evening snack. I must try adding methi next time..coz I know it tastes yummy. I have used palak in pakodas, methi also should go well.